Did Iran's Crackdown on Dissidents Include Nuclear Scientists? A four-month extension granted by the P5+1 to the Islamic Republic of Iran to comply with the nuclear arms deal brokered in late-2013 and negotiate a final deal ends Nov. 24. Iran has been required to fully account for its nuclear development activities and offer all assistance to international inspectors, in return for the lifting of crippling international sanctions. Iran welcomed the easing of financial and other sanctions, but many in the international community believe that Iran has failed to keep its end of the bargain. "No deal is better than a bad deal," President Obama is on record as saying, but with the not-insignificant distraction of the ISIS terror sweep into Syria and Iraq, there are fears that the notoriously smooth-tongued Iranian negotiators will pull another fast one and wriggle out of their commitments. Against this background this week came renewed allegations from Iranian dissidents that the high-profile slaying of a senior Iranian nuclear scientist in January 2007 may have been carried out by the regime itself, and not by Israel's Mossad intelligence service, as has been widely assumed. The allegation has been made by Mahboobeh Hosseinpour, the sister of the late Ardeshir Hosseinpour, who died in suspicious circumstances after apparently expressing deep concern at the direction of the Iranian nuclear program. "sought to enlist Dr. Hosseinpour to work on increasing the IRI's capabilities in uranium enrichment for the purpose of building atomic weapons with a secondary goal of teaching and supervising Russian and North Korean scientists in order to accelerate this project. In order to incentivize Dr. Hosseinpour, he was offered the rank of a two-star general in the IRI's Revolutionary Guard apparatus along with ownership of three factories related to manufacturing of parts for the nuclear projects. This offer received a harsh and negative reaction from Dr. Hosseinpour who promptly ridiculed and rejected it." Mahboobeh Hosseinpour believes it was her brother's "persistent resistance against the IRI regime and its nuclear intentions that led Ali Khamenei to order his assassination on January 15, 2007." It's a powerful claim, but one without evidence. On its own, it would be hard to accept that – like a classic James Bond villain – Iran killed one of its leading nuclear scientists. But similar allegations in recent years appear to reflect the Iran's zero tolerance view of any internal dissent. In 2012, Britain's Daily Mail reported claims by London-based dissident Potkin Azarmeh that Iranian intelligence agents, and not a man apparently executed after being paraded by the regime as an Israeli spy, killed 50-year-old Masoud Ali Mohammadi, another senior Iranian scientist allegedly working on the nuclear development project. "Some Iranian dissidents believe that [Iran] has used the cover of its war with Israel to crack down on internal opponents, with some saying that Mr Mohammadi was killed because he was a supporter of reformist candidate Mir Hossein Mousavi," the Daily Mail reported. "Ali-Mohammadi died in January 2010 when a remote-controlled bomb attached to a motorcycle outside his home in Tehran went off." This week's allegations are clearly designed by Iranian dissidents to plant questions in the mind of the public and of international politicians prepared to accept the benign smile of President Hassan Rouhani as a genuinely moderate new face in Iran. The potential double-bluff of killing its own sharpest nuclear brains, they intimate, is not far removed from the ruse being performed under the noses of the international community who have failed to understand the extent to which Iran's nuclear program continues to develop, even with IAEA inspectors in the country at the behest of the P5+1. Any potential extension to negotiations, argue regional experts such as Ephraim Asculai, who worked 40 years with Israel's Atomic Energy Commission (IAEC), could be a fatal mistake. 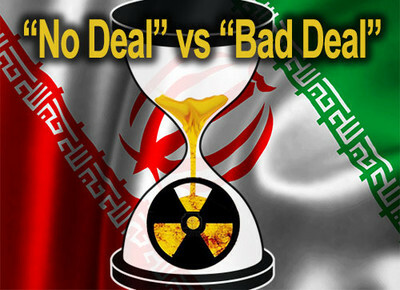 "Iran is... interested in buying time," Asculai believes, "because the window of opportunity for breaking out – making an explosive nuclear device – narrows with each passing day." International negotiators seem to have given up on dismantling Iran's nuclear program, Landau warns. "Rather, at this point they seek only to slow it down, with the hope that they will be able to prevent in time an Iranian rush to concretize its military nuclear capability." Israeli Prime Minister Benjamin Netanyahu made it clear at the United Nations General Assembly earlier this week that Iran remains the biggest threat to world peace. The international community should not be distracted by the ISIS issue, Netanyahu warned. Iran remains the major supporter of Syrian President Assad's disgraced regime, bankrolls Hizballah in south Lebanon and now inside Syria, and continues to do all it can to support the terror regime of Hamas in Gaza. A glance at Iran's brutal repression of internal dissent and its endemic corruption appears to add weight to the view that Tehran will indeed go to any lengths to silence questioning voices and should not be trusted. Ranked a dismal 144th of 177 nations in the 2013 Transparency International corruption index, Iran has long found ways of getting around international sanctions, flagrantly violating human rights, and ruling through fear. "The new administration has not made any significant improvement in the promotion and protection of freedom of expression and opinion, despite pledges made by the president during his campaign and after his swearing in," U.N Secretary General Ban Ki-Moon observed as recently as March. Leaders in the opposition Green Movement, which attempted to bring about reforms in Iran and still argues that they were robbed of election victory in 2009 due to widespread government orchestrated fraud, have long since been rounded up. Former Prime Minister Mir Houssein Musavi has been confined to house arrest. Critics of the Iranian regime suggest that many of those arrested and summarily tried for offences such as drug dealing are in fact Green Movement supporters and supporters of other opposition groups. Some have been executed. 1) The [Iranian] authorities maintained severe restrictions on freedoms of expression, association and assembly. Dissidents and human rights defenders... were arbitrarily arrested, detained incommunicado, imprisoned after unfair trials and banned from travelling abroad. Torture and other ill-treatment were common and committed with impunity ... They took steps to create a controlled, national internet, routinely monitored telephone calls, blocked websites, jammed foreign broadcasts and took harsh action against those who spoke out. 2) Government critics and opponents were arbitrarily arrested and detained by security forces. Tens were sentenced to prison terms after unfair trials. Dozens of peaceful government critics detained in connection with mass protests in 2009-2011 remained in prison or under house arrest throughout the year. Many were prisoners of conscience. 3) Political and other suspects continued to face grossly unfair trials before Revolutionary and Criminal Courts. They often faced vaguely worded charges that did not amount to recognizably criminal offences and were convicted, sometimes in the absence of defence lawyers, on the basis of "confessions" or other information allegedly obtained under torture. Courts accepted such "confessions" as evidence without investigating how they were obtained. 4) Hundreds of people were sentenced to death. Official sources acknowledged 314 executions. Credible unofficial sources suggested that at least 230 other executions were also carried out, many of them in secret, totaling 544. The true figure may have been far higher, exceeding 600. There were at least 63 public executions. The Mujahedeen el-Khalq (MEK) is one of a number of Iranian opposition movements that have attempted to challenge the rule of the Ayatollah's since 1981. These movements have been under sustained assault from the regime and have been forced out of the country, even though Iran publicly scoffs at them and insists they are of no consequence. The MEK was granted sanctuary by the U.S. at Camp Ashraf in neighboring Iraq in 2004, even though it was at that time still officially a designated terrorist organization. It was de-listed in 2012, despite furious protests from the Iranian government. Why, then, did the U.S., EU, and UK designate a pro-democracy Iranian group? "The MEK was put on the terrorist list solely because the mullahs insisted on such action if there was to be any dialogue between Washington and Tehran," Lord Alex Carlile, former independent reviewer of British anti-terrorism laws, explained in The Guardian in October 12, 2012. "This was all part of a misguided effort to reach out to 'moderates' in the regime, an effort that accomplished nothing but gave Iran the time it needed to commence and advance its nuclear development." Carlile accurately predicted what would happen next at Camp Ashraf. By September 2013 the Shi'ite government of former Iraqi Prime Minster Nouri Al-Malaki had grown increasingly close to the Iranian leadership. Al-Malaki constantly called for the Iranian dissidents at Camp Ashraf to be removed. In an apparent show of loyalty to Iran it is alleged that on September 1, Iraqi forces entered the camp and murdered not less than 52 members of the MEK, a massacre that drew furious responses from the international community, including the U.S.
"In reality," Carlile observed, "far too much attention has been paid to disinformation disseminated by Tehran and its lobbyists in an effort to make the western countries conclude that there is no viable opposition and no chance of change from within – leaving the west to choose between making concessions to Iran or going to war, both very unpleasant choices." Given all of the above, just a taste of the huge number of dossiers on Iran's scheming, murderous regime that consistently seeks to mislead and misinform, surely the P5+1 will not allow the Islamic Republic another opportunity to buy time for its nuclear program and potentially further de-stabilize an already toxic situation in the region. Or will it?